I sat to write this update and had to think hard about what I was working on this week, that is bad. I did work on a Flora McBunny as well as a Rose Burrow. Flora was finished and posted off and Rose will be heading to her new home early this week. Here is a look at the Flora McBunny I was working on. I did have a meeting earlier this week about the development of my ideas and designs and for the next couple of months I’m taking time off from orders to do this, this should free up my time to develop my designs some more. I’m not sure what if any for the moment I’ll be able to share but there will be a big reveal when I can. So I will take out some of my smaller knitting pieces to work on for my yop year. I have a few that need finishing and with us being in the second half of this yop year its time I started to work on them. So there you have the sum total of my crafting week, not a whole lot going on in terms of end products but lots going on with ideas and that part has to happen first in order to have end products. This week has also seen the return of bugs, the chicken pox left the younger children open to catching other bugs and have picked up a mild vomiting bug and headaches and aches and pains one so I still have my Florence Nigthengale hat on. Looking forward to catching up with you all this week. This entry was posted in Crochet, Finished object, Year of projects and tagged Flora McBunny, Rose Burrow. Bookmark the permalink. Very cute bunny. Good luck with designing. Hope your children are better soon. Oh I hope things clear up and healthy up at your place. As well as being Florence Nightingale I imagine this entails a lot of cleaning, disinfecting and clothes washing. Phew! Yes it does! but hopefully we shall be bug free soon oh so very soon, we are all ready for that. Those. Gus are nasty! Even appear to be lingering In homes in my neck of the woods… Another flora! Love love love.. I think I had the chicken pox when I was 3 or 4 years old. Husband has had it at least three times and we don’t know if he built up the immunity. Little Man hasn’t had it but I suspect he’ll either get it or he’ll get the vaccination for it. Who knows. 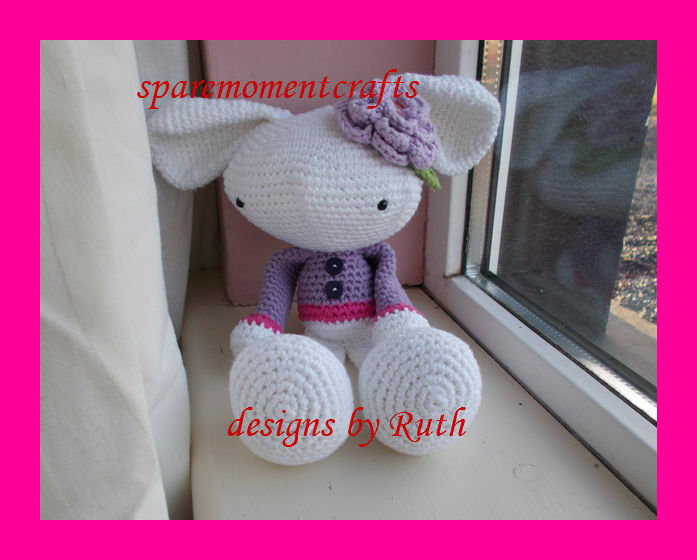 Sweet bunny as usual Ruth! I am looking forward to your big reveals but it will be fun to see some knitting from the list too. Balancing it all can sure be a chore sometimes, can’t it? I am so,so sorry the kidlets are sick again–tummy bugs are the worst! It feels like so many people are fighting bug after bug this winter—Hope all are well soon! May your Nightingale touch bring quick, soothing healing vibes to your sick babies. Damn bugs. Good for you on keeping it realistic. I haven’t posted for YOP for some time. Poor children! I hope they get rid of it fast before you get it too. Who woould take care of them all then? It’s true what they say..rabbits multiply quickly! Cute as usual. What a lovely blog you have here and the bunny is too cute!